The Supreme Court has stayed the extended construction of Tashkent hotel in Shimla, that falls in the prohibitory heritage Mall Road zone, following a petition by the Municipal Corporation of Shimla (MCS) alleging that the construction was being done in violation of the laid down guidelines. The tribal people of this village are in a state of utter neglect ever since the flash floods in Sutlej washed away their houses and obliterated agricultural land under horticulture four months back. Even after strict guidelines issued by the H.P. High Court to the government, some influential persons are still running stone crushers violating the existing norms in the adjoining area of Mandi and Kulu districts. Despite government directives to disconnect water, electricity and sewerage connections of all unauthorised constructions in the state, there has been poor compliance and a special committee, constituted for the purpose, has once again asked the departments to report the progress on this front. Tall claims of surplus power in Himachal notwithstanding, new industrial units, including a MNC near Baddi, have been forced to use diesel generation sets to meet their power requirements. Emitting poisonous fumes, these sets adversely affect environment. The reconstruction work on a Bailey bridge, by the 18-Engineers Regiment of the Army, at Kharo, 22 km from here, has come to a standstill following the lack of back space needed to push the assembled bridge on the Sutlej. In a step that is likely to benefit thousands of persons, the Himachal Pradesh Government has decided to withdraw the professional tax imposed on persons with over Rs 1 lakh annual income. Shikha Sharma, a student of second year of Himachal Institute of Dental Sciences, Paonta Sahib, today committed suicide by hanging herself from the fan in her room in the college hospital, according to police sources. Panchayats which elect their representatives unanimously in the ensuing elections will be given special grant of Rs 10 lakh over and above the regular budget for carrying out developmental activities. Concerned over the mounting losses of the Shimla-Kalka narrow gauge section, the Railways has decided to take steps to improve its financial viability. The Department of Telecommunication (DoT), Government of India, on Wednesday recalled 1100 Indian Telecom Officers, Group A, who were on deputation with the Bharat Sanchar Nigam Limited (BSNL) for the past five years with immediate effect. It has created a stir in BSNL. The decision will hit BSNL telecom and mobile services in the region. The Himachal Pradesh Government recently okayed a three-storeyed ‘Chamba bus terminus’ project with an initial outlay of Rs 20 crore on a “construct, operate and transfer” basis at the zero point. The Indian Telecom Service Officers’ Association has termed the Central Government’s decision to recall 2,200 ITS officers, who are on “deemed deputation” with BSNL, as an arbitrary step in the name of disinvestment. The Indira Gandhi Medical College Resident Doctors Association has requested the government to relax the eligibility rules for being appointed as Registrar. The Institute of Engineering and Emerging Technologies held an inaugural function of the faculty and student chapter of the Indian Society for Technical Education today. The Shimla Tehsil (Gramin) Vikas Sabha Dhami has resented the move to merge 10 panchayats below Ghanahatti with the Kumarsein Assembly constituency under the delimitation process. The state government has taken concrete steps to ensure 70 per cent employment of Himachalis in industries. Indication to this effect was given by Mr Kuldeep Kumar, the state Industry Minister on Wednesday while addressing industrialists at a seminar on employment and employability to the Himachalis at Parwanoo. Mrs Kamala Sharma, Chairperson, Himachal Pradesh Mahila Congress has been nominated member of the All-India Congress Committee. This was revealed here today by Ms Sushma Sharma, General Secretary, Constituency Congress Committee. The permission to construct the hotel, owned by Gopal Mohan Aggrawal and Mool Krishan Aggrawal, was given by the Himachal Pradesh High Court in an interim order in December last year, allowing their application. Challenging the High Court’s interim order, the corporation moved the Supreme Court contending that no construction of an extended hotel building could be permitted on the plot adjacent to its old building as such activities were prohibited under the Shimla Town Planning Act after a 2003 notification of the state government, declaring entire the Mall Road area as heritage zone. Accepting the argument of corporation counsel Anil Nag, a Bench comprising Mr Justice S. N. Variava and Mr Justice S. B. Sinha stayed the High Court order of August 4 and directed that further construction should immediately be stopped. Notices were also issued by the apex court to the Aggrawals, the state government and its Director of the Town and Country Planning Board. Mr Nag said the High Court had failed to take into consideration the fact that the Heritage Zone Regulations of 2003 “prohibited” any new commercial constructions in the area declared as “natural heritage zone” as the rules only permitted renovation or reconstruction of old building in its original form. This was the second petition by the corporation against the High Court order permitting construction of commercial buildings in the heritage zone within a month. Its counsel contended that the “High Court could not have granted (such) a relief at an interim stage, which amounts to allowing the writ petition” before a final order is passed. The Town and Country Planning Board had rejected the hotel owner’s application seeking permission for constructing the building on a piece of land adjacent to the old building of the hotel. The state government had issued the 2003 notification to check haphazard construction in the Mall Road area as it was not only causing environmental problem but posing a threat to fragile topography of the region, the corporation counsel contended. Situated on the Indo-Tibet international border, 100 km from Reckong Peo, the district headquarters of Kinnaur, Leo, was the worst affected. Residential houses of at least 15 families were completely washed away in the floods while 27 families were forced to leave their homes. These families are now sheltered in a local school and Regional Centre of Agriculture University. Immediately after the floods, the state government announced free ration and other essential commodities to the affected families for a period of at least six months. However, the affected families alleged that they were provided with ration that lasted just 15 days. When contacted, Mr K.D. Verma, District Food and Supplies Controller, Kinnaur, said the ration for 15 days was distributed among the flood victims of Leo village alone. Panma Dorje, a local resident, said the Agriculture University authorities had asked them to vacate the building without making any alternative arrangement for them. He demanded that the state government should make arrangements for them as the winter season had already arrived. “The people of this village who are poor have been left with no money to build their houses”, said Amrit Lal, another resident of the village. He demanded the state government gave grants to the affected families to build their houses. Ranjit Singh said the district administration had provided an immediate relief of Rs 35,000 to each of the affected families. Since most of the land under agriculture in the village was wiped out in the flood, the disbursed amount was, thus, spent on purchasing ration for the winter season. Keeping in view the harsh living conditions in this tribal belt another ‘battle’ for survival is inevitable. “In the absence of shelter, it will not be easy for them to survive under the harsh weather conditions in days to come”, said Mr Tejwant Negi, district president of the BJP. He alleged that road and telecommunication link to the village had not been restored. Sundernagar: Even after strict guidelines issued by the H.P. High Court to the government, some influential persons are still running stone crushers violating the existing norms in the adjoining area of Mandi and Kulu districts. Last year, the court while deciding a public interest litigation petition had laid down guidelines and parameters for existing stone crushers as well as for setting up the new ones in this hill state. Afterwards, the state government formulated a policy in this regard. Under these norms it is very difficult to set up a new crusher, still some influential persons are running stone crushers. One such crusher has been functioning at Bihali village situated in the border area of Mandi and Kulu districts for the past few months. It is set up by Gammon India Limited. Enquiries at Bihali village which is about 70 km from here revealed that the crusher was set up here a few months ago. According to residents of this area the crusher is functioning under the patronage of people close to political persons despite opposition from the local residents. Interestingly, this crusher was set up after the formulation of the new policy, though no crushers can be set up near roads, villages, hospitals and educational institutions, parks and sanctuaries. But the present crusher is just a few metres away from the road. When asked about it, a source from the Mining Office, Kulu, admitted regarding the functioning of the crusher but said certain conditions were relaxed in this case. According to state geologist Arun Sharma the permission was given following recommendations made by the Site Appraisal Committee. It was said under new norms about 100 crushers were closed down throughout the state. When asked about the present crusher which is functioning without complying the norms he said he had no information about it. However, as per a source from the office of Gammon India Ltd, the crusher was complying with all the norms. On the other hand the residents of area claim that they have told time and again the Mining Officials at Kulu about it yet no action is being taken. Interestingly, top officials of the H.P. Government had given an undertaking before the High Court about the compliance of norms for existing crushers and for setting up new ones in Himachal Pradesh, but the fact remains that influential persons were still running the stone crushers, violating laws. The Director, Town and Country Planning (TCP), has shot letters to the Himachal Pradesh State Electricity Board (HPSEB) and Irrigation and Public Health Department to report the progress as to how many connections have been disconnected so far. The committee for action against provisions of Section 83-A of the TCP, pertaining to electricity, water supply and sewerage, has been constituted under the chairmanship of the Chief Secretary. The Director, TCP, is the member secretary of this state level committee. Dharamsala in district Kangra tops the list of towns which has maximum number of 553 electricity and 164 water connections to unauthorised constructions. In Palampur, 169 electricity and 49 water connections have been released while this number in Mandi is 111. In Rampur, 200 electricity and 167 water connections have been given to unapproved structures. No NOC was obtained by owners of these unauthorised constructions from the TCP department. There are a total of 1196 electricity and 553 water connections that have been given to unauthorised constructions all over the state. “Compliance of these directives has been very poor and so far neither the HPSEB nor the IPH department has intimated us about the disconnections made after the formations of this committee,” said a TCP official. Officials feel the need for strict action against those violating the TCP regulations and are strongly opposed to any kind of concessions like offering a retention policy. “By regularising most of the unauthorised construction in Shimla as part of the retention policy, the government is only encouraging people to undertake unauthorised constructions,” opined a senior official. Under the retention policy the government had received more than 1,400 cases for regularisation in the five Special Area Development Authorities (SADA) of New Shimla, Shoghi, Dhalli, Tuttu and Kufri. Most of these cases have been decided and those who qualify the TCP regulations have been regularised. Sources in the TCP said pressure was now being mounted on the government to liberalise its retention policy and extend it to other towns like Rampur, Rohru and Mandi. “This step would only defeat the purpose of the drive launched by the TCP department to check the unauthorised constructions and regulate construction in the towns,” remarked another official. Cipla Pharmaceuticals, which had to put its expansion plans on hold, is forced to use about 8,000 litres of diesel on a daily basis. The unit was issued a power availability certificate for 3,500 kw in January this year from the 11 kv sub-station. A synchronising machinery was, hence, installed to cater to the load. The board, however, refused to grant them the requisite power and only 1,000 kw power could be granted to the unit. Despite presenting their case before board officials to enhance this power supply to 1,900 kw little has been achieved. Senior officials of the electricity board, however, justify the situation quoting the latest instructions of the state Electricity Regulatory Commission. They say the unit could get only limited power from the 11 kv line but any amount of power could be given from the 66 kv line. This arrangement, however, puts an additional monetary strain on the unit. The unit officials plead that they would have to incur at least Rs 2 crore on installing equipment to synchronise their machinery through the 66 kv sub-station. Another pharma unit, Ankur Pharma, has also sought permission to run diesel sets as adequate power is not available to them. A sister concern of Ankur Pharma, too, has been forced to operate diesel sets. Glemmark is also facing power shortage. Board officials, while expressing their helplessness, say they are bound by the new directions of the regulatory commission. These units can get adequate power from the 66 kv sub-station, anytime but they prefer to procure it from the 11 kv line. While power augmentation of the existing 11 kv sub-station will be completed within 18 months, it would make available a load of 150 mva. Tenders had already been floated for setting up the new 66 kv sub-station at Manpura. They said the matter had been discussed with the industrialists threadbare in July. Initially, they had consented to shell out money for this new sub-station. 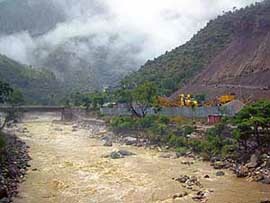 It may be mentioned that the bridge was first destroyed on June 27 this year following a flood in the Sutlej and later, when it was under reconstruction, it collapsed all of a sudden on September 8 claiming lives of 34 Army men. Sources in the 18-Engineers Regiment disclosed to The Tribune that they needed a back space of at least 110 m to push and then set up the assembled bridge but the required space was not yet available. Moreover, there was a need to raise the height of the bridge which would require more time to re-establish the foundation beams on both sides to set up the assembled bridge, said the sources. On the other hand, neither the state government nor the Army had so far begun the construction work on other bridges at Karcham, Akpa, Khab and Leo that were destroyed in the flood even after four months of the disaster. The Public Works Department of the state government had, however, established a temporary Bailey bridge at Akpa which was of no public utility as the traffic through Akpa could only be restored if the Bailey bridge at Kharo was completed. Due to this problem, more than 80 per cent of the apples of upper Kinnaur could not be transported to the markets through road. As per the figures available from the local administration, only five lakh boxes containing apples had reached the markets as against the expected 20 lakh boxes. "Both the civil and Defence authorities are least bothered about the apples of upper Kinnaur that are yet to be transported to the markets," alleged Mr Tejwant Singh Negi, district president of Bharatiya Janata Party. He further alleged that both the civil and Defence authorities had failed to initiate reconstruction work on these five bridges which were considered to be the lifeline of the tribal people. Porters were still being hired to transport essential commodities at many points on a stretch of about 100 km in Pooh sub-division of district Kinnaur, he said. The Tribune tried to contact Officer Commanding M.L. Kom of the General Reserve Engineering Force (GREF) but his telephone operator revealed that he was out of station. This decision will be implemented by November 1, the Excise and Taxation Minister, Rao Rangeela Ram, told a “meet-the-Press” at the Chandigarh Press Club here today. “With the withdrawal of professional tax, the state government will have to bear a burden of around Rs 30 crore annually,” he added. The state government would work out alternative sources of income to generate the money that the government would loose with the withdrawal of professional tax, he said. However, “no burden will be imposed on common people,” he pointed out. He, however, did not say the details how the government would cover up the loss by way of alternative sources. “It is a financial matter. I cannot tell details...but the common man will not be affected,” he said, adding that the state government had generated an additional revenue of Rs 140 crore with the implementation of VAT. Reiterating the commitment of the state government to the welfare of the women, the minister informed that higher education, including the professional education, had been made free for the girl child. Efforts are also being made to rope in the private institutes to provide free education to the girl child, he added. Shikha is a resident of Dharamsala and her parents are expected to reach late this evening at Paonta Sahib. Mr Padam Chand, DSP Paonta Sahib, said the post-mortem of the girl would be conducted after the arrival of her parents. Meanwhile, there was panic on the college campus as the girl had written a three-page suicide note in which she had charged three teachers of the college with harassment. She had also written the name a girl student and charged her with doing some black magic on her. The room of the hostel in which she hanged herself was bolted from inside and it had to be broken. This was announced by Mr Virbhadra Singh, Chief Minister, while addressing a public meeting at Sumerkot in Rohru subdivision of Shimla district after inaugurating the Tikkari-Shalawat road constructed at a cost of Rs 60 lakh. He said the objective of special grant was to encourage people to elect their representatives by consensus so that elections did not lead to division among villagers. Unanimously elected panchayat functionaries would be more effective in implementing development schemes, he said. Referring to steps being taken by the government to improve the basic infrastructure in rural areas he said a Rs 322 crore accelerated power development and reforms programme had been launched in the state to bring about the systematic improvement in power supply. The aim was to ensure quality and uninterrupted power to people. The power board would replace all the electric wooden poles with seel and cement poles in a phased manner. Mr R.Velu, Union Minister of State for Railways, who was on a two-day visit to the state to understand the problems of the narrow gauge tracks, said the total income for the Shimla-Kalka section was just Rs 9 crore whereas the Railways was spending over Rs 18 crore on its maintenance and operation of train services. It was being maintained as a heritage rail line but still losses had to be brought down to a reasonable level. It was likely to get the world heritage status, like the Darjeeling rail, for which a proposal had been sent the UNESCO, he added. The occupancy was just 11 per cent in the section and efforts made in the past to improve it had not yielded the desired result. He also ruled out the possibility of upgrading the track to reduce travel time as it would require over Rs 400 crore. He said the new locomotives would be acquired to replace the aged ones to ensure reliable services on the section. Already approval had been granted for acquiring three locomotives. Besides, some locomotives in the existing fleet would be upgraded. According to sources in BSNL, there are over 2200 ITS officers on deputation with BSNL for the past five years. About 1100 ITS officers in Punjab and Himachal Pradesh have got stay order from the high court and the Chandigarh Administrative Tribunal (CAT) to continue with BSNL till first week of November. “But the DOT recalled rest of 1100 ITS officers to the parent department as they had neither opted nor got stay from the court”, revealed the sources. Because of this decision the ITS officers did not attend duties today to register protest against BSNL and threw the Internet services out of gear for hours in Delhi and the northern region. Members of the ITS Officers Association (ITSOA) told The Tribune that they would decide the course of action only after the case come up for hearing in the high court and the CAT in the first week of November. BSNL, the Telecom, Internet and mobile services provider would be hit hard in the country due to the shortage of managers, the ITSOA members said. Disclosing this here yesterday, Mr Harsh Mahajan, Animal Husbandry and Urban Development Minister said the proposed bus stand was one of the flagship projects in the state conceived by the state government. Mr Mahajan said the government had also approved the layout plan of a three-storeyed hilly structure of the new terminus. The process to float tenders for the construction of bus terminus was in the pipeline and would be finalised soon, he added. According to the layout plan, the parking of the buses had been proposed at the ground floor, while the first floor would be used as a parking-lot for commercial vehicles accommodating more than 100 vehicles at a time, Mr Mahajan informed. The second floor, which went up to the road-level of Chamba-Bharmour highway is proposed to park the buses bound for Bharmour and its adjoining areas. The Indian Telecom Service Officers’ Association (ITSOA) has termed the Central Government’s decision to recall 2,200 ITS officers, who are on “deemed deputation” with BSNL, as an arbitrary step in the name of disinvestment. But they have hailed the Rajasthan High Court stay order passed today in Jaipur that has ordered the reinstatement of over 75 ITS officers in BSNL. with BSNL or join the department. But ITSOA insisted that the government should give them 10 years’ guarantee and assure them of the same pension and promotional benefits from BSNL which they enjoy as employees of Telecom Department — a demand that the government has not accepted so far. The Indira Gandhi Medical College (IGMC) Resident Doctors Association has requested the government to relax the eligibility rules for being appointed as Registrar. In a statement issued here today, the Association said the government had recently made it compulsory for General Duty Officers (GDO) to serve in the field for three years after doing postgraduation to be considered for the post of Registrar at the IGMC and at Tanda Medical College, Kangra. “Presently 50 posts of registrars are lying vacant in various departments of the IGMC and if these fresh conditions are followed there will be further shortage of doctors eligible for the post,” said Dr Rajesh Sood, President of the Association. He added that even in the interview there was discrimination while awarding of marks and no preference was given to those having higher qualification. “Since there has been no response to the written request made before the Principal Secretary, Health, to give us a patient hearing, we will be left with no option but to knock the door of the High Court,” he said. The Institute of Engineering and Emerging Technologies held an inaugural function of the faculty and student chapter of the Indian Society for Technical Education (ISTE) today. Mr R.P. Sukerchakia, section chairman of Northern Region, was the chief guest. Speaking on the occasion, he highlighted the activities of ISTE, and the benefits that all members could now avail. The inauguration ceremony was followed by a paper presentation contest on ‘Employability of Engineering Graduates - How to Enhance”. Naman Katoch and Naveen Sharma won the first prize, followed by Isna Chauhan (second) and Saurabh Mahajan and Chaksu Arora (third). Mr R C Bahl, Principal, spoke on the role of personality development in improving employment prospects. The chairman of the sabha, Mr Roshan Lal Thakur, today said people of the area would resent any such move, as it would cause inconvenience to public. He added that a meeting would be held on October 23 at Ghanahatti to chalk out the future course of action so that the interest of the people of the area could be protected. He said very soon a sub employment office would be opened at Baddi. Industrial units organising recruitment camps outside the district of their location and which hold campus interviews in colleges, universities, technical training institutions located anywhere in the state would be eligible for an incentive for recruitment of bona fide Himachali’s at Rs 500 per candidate. Mrs Kamala Sharma, Chairperson, Himachal Pradesh Mahila Congress has been nominated member of the All-India Congress Committee (AICC). This was revealed here today by Ms Sushma Sharma, General Secretary, Constituency Congress Committee. Ms Kamala Sharma, a daughter of a former Minister “Sher-e- Kulu” Mr Lal Chand Prarthi, was appointed chief of the State Mahila Congress in July this year. Mrs Kamala Sharma, thanked Mrs Sonia Gandhi and Ms Vipolav Thakur for the post. Congress leaders in this district expressed thanks to the party high command for conferring honour to the district. The police impounded a truck near Marwala and recovered 600 boxes of liquor being smuggled into Haryana from Himachal Pradesh without paying the Excise duty. The team led by sub-inspector Lalman spotted the truck ( RJ 13G-7477) near Baddi and signalled the driver to stop. However, the truck sped towards Haryana border. The team pursued the vehicle and stopped it Marwala close to the border.